Some people stay away from alcohol entirely when trying to reach their fitness goals and that’s TOTALLY fine. However, I’m here to explain that you still can enjoy alcohol without having to sacrifice your fitness goals. Being more of lifestyle fitness coach, I encourage my clients to approach health and fitness in a way that there’s not a start and end date. So, if you’re someone who occasionally enjoys alcohol and wants to continue enjoying it while keeping wellbeing in mind, you most certainly can. Is it Okay to Drink Alcohol on Your Fitness Journey? I am all about being realistic > optimal in my personal approach and with clients. Would reaching your fitness goals be easier sans alcohol? Probably but some people enjoy a drink or two from time to time and there is nothing wrong with that. 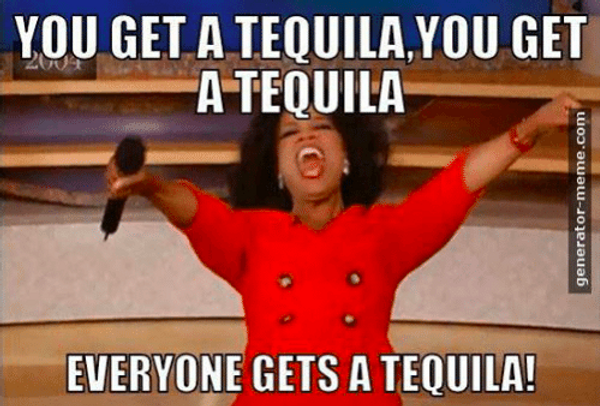 So how can you incorporate alcohol without completely derailing yourself from your plan/goals? Like anything else you are consuming, you account for it. Now, you will need to have a basic understanding macros in order to apply this. If you don’t, lucky for you I have two blog posts specifically dedicated to macros: what they are & how to calculate them for yourself. Go ahead and check those out first if macros are a bit foreign to you. Are Alcohol Macros Accurate on My Fitness Pal? So when you search an alcohol in my fitness pal you’ll see that the calories show up but then you’ll see only a few carbs and typically no protein or fat. For example, this red wine entry says there are 3.4 carbs and 120 calories. 3.4 x 4 = 13.6…. 120-13.6= 106.4. So where are those 106 calories coming from? 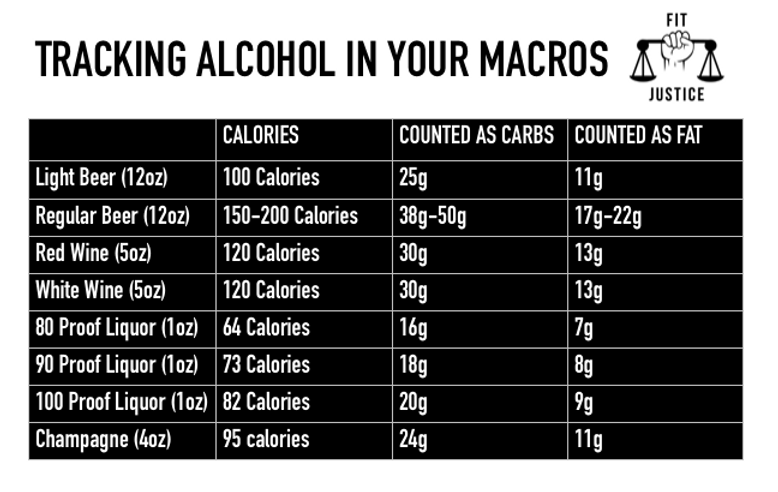 This may be a surprise to some of you that have been tracking macros but alcohol IS also a macronutrient. That’s right, there are four macronutrients: protein, carbs, fat and alcohol. The reason this isn’t prominent in the fitness world/tracking apps is because it is NOT an essential macronutrient as are the three that you are familiar with. So, while it is a macronutrient, your body does not require it to survive (bummer, I know). Alcohol = 7 calories per gram. But of course tracking apps don’t account for this because it’s not an essential macronutrient. How do you Count the Calories in alcohol? 1. You can count your alcohol calories as carb or fat calories. 2. Log the alcohol entry as is, make sure you hit your protein goal for the day then just pay attention to your total calorie goal. This would still be counting it as carbs or fat, you’re just not paying specific attention to that and allowing yourself to avoid some math. So let’s say you do want that 5oz glass of wine. Choose which macro you’d rather sacrifice (carbs or fat) and divide it by the # of calories per gram it has. For carbs you would divide 120/4 and get 30g. For fats you would divide 120/9 and get 13g. You could also do a combination of both. For example, divide 120 calories/2 which = 60. Then, divide 60/4 which =15 and 60/9 which =7 So 15g carb and 7g fat for that 120 calorie class of wine. I usually like to split it up because I’m greedy and don’t want to sacrifice too many of my carbs or fats. Now, we’ve just gone over JUST alcohol. What it’s mixed with is where things can get troublesome. Especially if you are trying to lose fat. You have to be careful with what you are mixing your alcohol with because this is where REAL carbs can add up! If you are drinking hard liquor, stick to diet sodas, 0 cal fizzy waters or water flavor enhancers like Crystal Light. Crystal Light actually makes a low cal margarita mix-which would be a great option for those of you that like ze tequila. Avoid any type of cocktail you see on a menu or anything that sounds fruity. That’s where A LOT of sugar/carbs will add up. And if you have balls like I don’t and like to drink straight liquor, then props to you! HERE is a list of calories in different proofs of hard liquor. As far as beers go, light beers are going to be your best bet, they range anywhere between 55 calories (Budweiser Select, which is not worth it in my opinion) and 110 calories. HERE is a great list of popular beers and their calorie content. My personal favorite light beer is Corona Light (99 calories) with a lime wedge and if I’m willing to sacrifice a little more calories, I love me a good ol Blue Moon (164 calories) with an orange slice. I also enjoy a glass of wine here and there. Pretty straight forward here aside from the fact that what a real serving of wine is looks way different than the glass I pour. What I love about THIS guide is that it includes the calories in the whole bottle. Because let’s be realistic here. Moving forward, the real problem that alcohol can cause in terms of your waistline is the food choices you make. This is where things can definitely get messy. There’s about a 95% chance that if I’m 3 beers deep, I’m not going to be making a food choice that will support my goals. I mean if I get a hold of just 1 tortilla chip…. I’ll just try again tomorrow. My advice here is that you pre plan everything. Be accountable up front and you’ll be more determined to stick to it. Leave it open ended and that’s just a recipe for some less than ideal choices. If you are going for a meal while drinking, try to stick to protein and veggies. Similar to protein, alcohol is not easily converted to fat HOWEVER, when present in the body, it does signal to the body that no sugar (carbs) or fat needs to be burned/used for energy. So while it may not ‘turn into’ fat, it does essentially put carb and fat metabolism on hold. What Happens When you Eat Terribly While Drinking? Of course there will be times that you end up overdoing it, with both alcohol and food. Congratulations, you lived your live. Take responsibility and move on, in the big picture it won’t matter and you can’t beat yourself up over being a human being. Get back to your plan immediately and keep chipping away. Leading from that, we all know that alcohol can definitely take a toll on our bodies the next day. This is why I recommend drinking PLENTY of water before, during and after drinking. If I am having more than one drink, I like to have a glass of water for every drink. Unfortunately, I can no longer function like I did in college where I would drink at least 4 different types of alcohol, throw down on some greasy food when the bars close and wake up the next day ready for anything. Now, I have a glass of wine or two with dinner and wake up feeling like I’m suffering from a minor head injury. 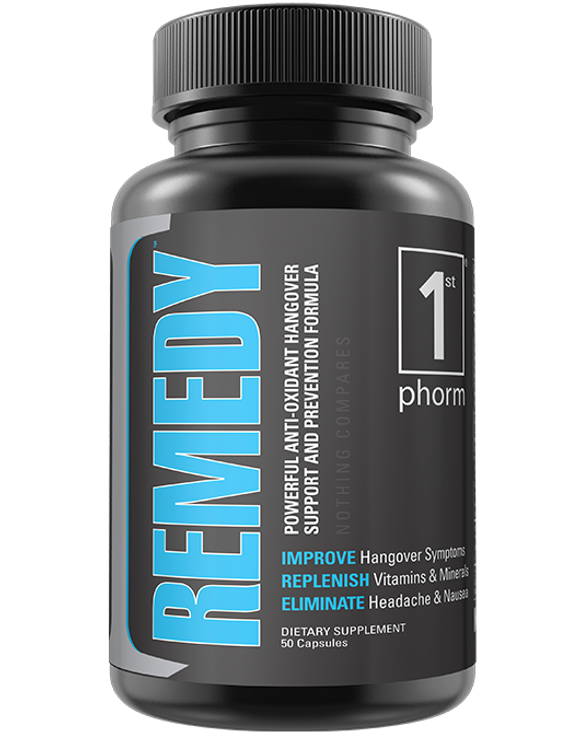 For those of you who’s body has also caught up with them, I recommend taking Remedy by 1st Phorm on occasions you know you will be consuming more than one drink. This is a supplement that is actually created to combat hangovers. Another reason I love 1st Phorm. They are real people that are on board with that fourth macro (right Sal?) and want something that’s going to help them not feel terrible the next day. All you do is take 5 capsules with 16-20oz water before drinking and then another 5 with 16-20oz water before you head to bed. So you get to have all the fun without all the consequences, woo! Notice I said *all the consequences. Remedy unfortunately does not erase the decisions you make while drinking. So don’t be a dumbass. You can read more about remedy HERE . It’s worth the $30 and shipping is free when you use that link! ***Please note in the chart above that you pick either carbs OR fat to track, not both. Unless you want to track it as carbs and fats like I mentioned previously. In that case, just divide each by 2. Please do be responsible when you drink, have fun but be safe and do NOT drive. It’s not worth your life or someone else’s. I also assume that anyone reading this is over the age of 21 and applying this legally.